OhCaptain has planned and oranized a charity event to benefit the Ronald McDonald House charity. 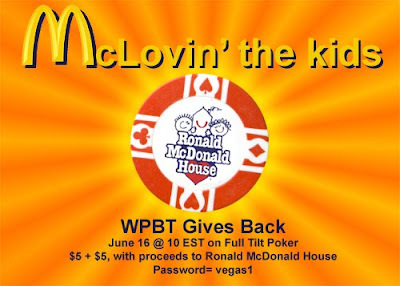 $5 of your buy-in goes to the Ronald McDonald House. It will actually be running in place of the Mookie. BDR will be broadcasting it. See the entire post by OhCaptain by following this link! Give something back by playing. Dead money is accepted (if you don’t play).